In 1997 a group of twenty women set out to become the world’s first all female expedition to the North Pole. Sue and Victoria were surprised to find themselves amongst them. En route to the most isolated and forbidding regions of the globe and facing the bitterest hardships, both were seeking a new beginning. For Sue these were the first steps following treatment for breast cancer. For Victoria, abandoning the security of her career was a good way to test her self-belief. This is mother and daughter, Sue and Victoria’s personal account of their trials and survival in the Arctic. Honest, shocking, but never too serious, Frigid Women is a celebration of the positive, ‘anything is possible’ attitude which can transform life’s tribulations into its most rewarding experiences. If you would like to purchase a signed copy, please contact us, otherwise you can buy it via Amazon. ​With its provocative title and foreword by Dawn French, one wonders if there is substance beyond this book’s packaging. The answer is undoubtedly yes. The subject matter – the first all-female expedition to the North Pole – is compelling. 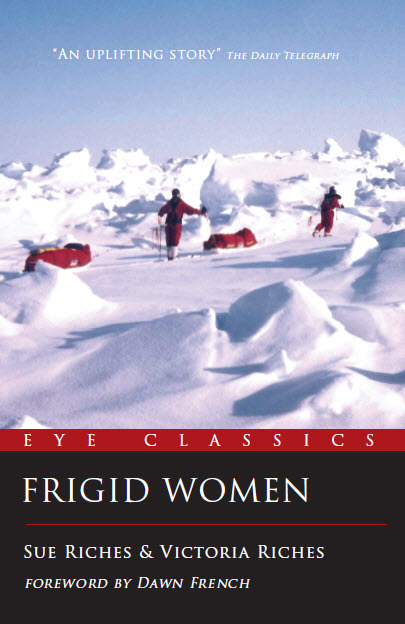 In addition, the intimate style of this account by the mother-and-daughter members of the expedition certainly adds another dimension to the “I may be some time…” stiff-upper-lip school of polar adventure writing that has long been a male preserve. The authors render their often life-threatening experiences with humility, honesty and a vital sense of humour. Simply, the narrative is unique and gratifying in that it reveals the human side of an inhuman challenge. Nearing the end of the expedition, Victoria writes “Mum had a major wobbly when I led two pulks over a crack and they fell ‘in the water you stupid child!’ …I think Mum was having a very bad day.” Perhaps an equally impressive feat is that a mother and a grown-up daughter could spend weeks in an icy wilderness and remain friends.